Air handlers or air handler units (AHUs) are appliances used as the delivery system to condition and circulate air as part of a heating, ventilating, and air-conditioning (HVAC) system. If you were to take a large metal box, mount a blower in it, have an opening in one end for intake air and another opening in the other end for the supply air, you would have an AHU. The stripped down AHU without heating or cooling elements, can be used for air circulation, air purification, humidity distribution, or just to introduce outside air into a structure. AHUs can be fitted with filter racks, air cleaners, hrv’s, humidifiers, ultra-violet lights, sound attenuators, zone systems, dampers, and more. AHUs, more often than not, connect to ductwork that distributes the conditioned air through the building, and then pulls the air back to the unit, through the return end of the unit. Although, rarely some applications discharge supply and return air directly to and from the space served, without ductwork. Small AHUs, for residential applications, may only include an air filter, air conditioning or heating coil, and blower. 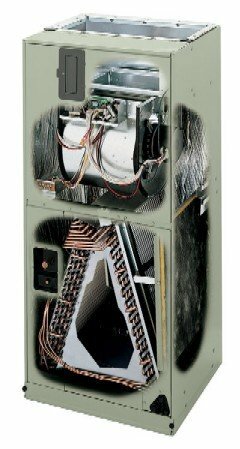 These units are often referred to as fan coil units (FCU). An air handler, large or small, which pulls in 100% outside air, and no re-circulated air, is known as a makeup air unit (MAU). Many homes and commercial buildings require make up air to overcome negative pressure created by range vents, bath fans, exhaust fans, and natural draft fireplaces. The introduction of make up air into a structure can be beneficial for controlling indoor air pollutants, and replacing stale indoor air. An AHU or FCU designed to be located outdoors, typically on a roof, is known as a packaged unit or rooftop unit. 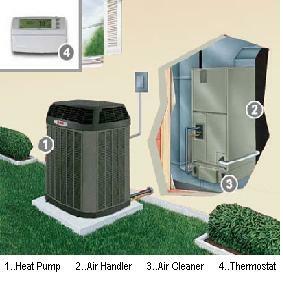 A packaged unit usually contains built-in elements for heating and/or air conditioning. The typical air handler has a large squirrel cage blower, or fan, driven by an AC induction electric motor to move the air. This motor may be a single speed motor, or it may be multi-tap to offer a variety of pre-set speeds, or it can be a variable frequency drive, which allows a wide range of air delivery rates. Some residential AHUs may use utilize a brushless DC electric motor that has variable speed capabilities. Larger commercial air handlers may utilize multiple blowers mounted at both the inlet and the supply ends of the unit. The typical residential unit has it’s blower located at the supply end of the cabinet. The filter set-up, heating and cooling elements are generally draw-through type, located on the return side of the unit. Depending upon location and the particular application, an air handler may be called upon to provide heating, or cooling, or both. Fuel-burning heaters or a conventional Freon-based evaporator coil may be installed directly in the air stream. 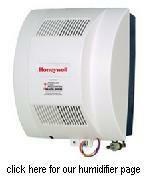 Electric strip heaters and heat pumps are used too. Evaporative cooling is possible in dry climates also. Coils may also be installed for circulation of hot water or steam for heating, and chilled water for cooling. The hot water or steam would be provided by a central boiler, and the chilled water would be provided by a central chiller. Air filtration is a must for an air handler, especially in a residential application. The typical residential AHU comes equipped with a 1” media filter. Upgraded air filtration is desirable for most applications, in order to provide clean dust-free air to the building occupants. Typically the air filter is located at the furthermost point of the return end of the unit. This is the also the most common location for any upgraded filtration options. Often filter grilles are utilized, as well, where filters are located at each return air grille, as part of the grille assembly. Ultra-violet lights for bacterial control may be installed in the unit, as well. Humidification is often added for use in colder climates where continuous heating will create drier air, resulting in uncomfortable air quality and increased static electricity. Evaporative bypass: supply air is blown through a water soaked pad inside the humidifier. The water laden air is then mixed into the air stream via the air handler. Powered evaporative humidifier: This unit has it’s own fan, which blows air through a water soaked pad and into the air stream. Steam humidifier: This type of humidifier creates steam and delivers the steam, via some sort of nozzle, into the air stream of the air handler for delivery. NOTE: Heat is needed for proper delivery of humidity. In radiant heated homes, the air handler will be called upon to distribute humidification without the benefit of a warm air stream. A steam humidifier can accommodate this call for humidity. An evaporative type cannot. Evaporative humidifiers are useless in a home where the primary source of heat is radiant. An HRV may be added to an air handler to provide ventilation into the home. An HRV will expel stale air to the exterior, and bring in a constant supply of fresh outdoor air into the residence. The HRV will also recover a percentage of the heat lost during the air exchange. The unit's blower can create vibration, which can be transmitted through the ductwork to structural members of the residence or building. Isolation is desirable. This can be accomplished with canvas connectors installed in both the return and supply ducting. In addition, rubber isolators can be used beneath the unit's cabinet, if the unit rests on a platform. If the air handler is hung, rubber isolators can be installed as part of the hanger assemblies. As mentioned above, an AHU can be a major component for cleaning the air you breathe in your home. With various options installed, the unit can deliver fresh air throughout your home, heat it, cool it, humidify it, de-humidify the home, and battle indoor air pollution for you.